The 361st Soundtrack of the Week is another compilation of soundtrack theme "covers", this time by Hank Marvin, famous as the guitarist from The Shadows (and one of my heroes). 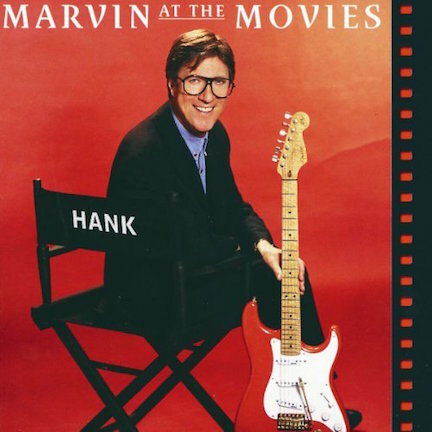 Marvin at the Movies starts with a fairly straightforward instrumental version of "A Hard Day's Night"" and proceeds with "The Sound of Silence" from The Graduate, which Hank gives a surprisingly groovy twist. The main theme from The Good, The Bad & The Ugly is perhaps a good example of the record as a whole. Marvin's guitar has a brilliant clarity and a wonderful sound. His playing is impeccable and tasty. But the arrangements and instrumentation are not his equals. They deserve credit, I suppose, for trying to recreate an orchestral score with a tiny ensemble but they'd be better collaborating with Petra Haden! Then there are the crowdpleasers: the themes from Goldfinger, Star Wars, a medley of James Bond themes and "My Heart Will Go On" from Titanic. Soundtrack afficionados who are also Hank Marvin fans will be mostly pleased with this record.